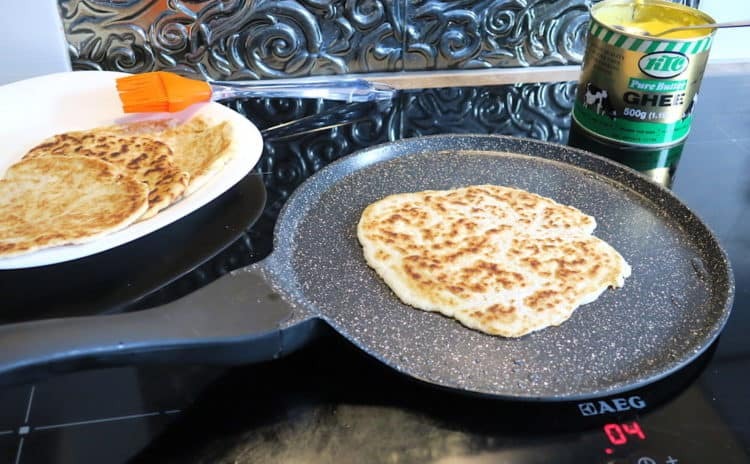 Keto Headbanger Low Carb Naan Bread recipe makes 4 naans at 1.8g carbs each. 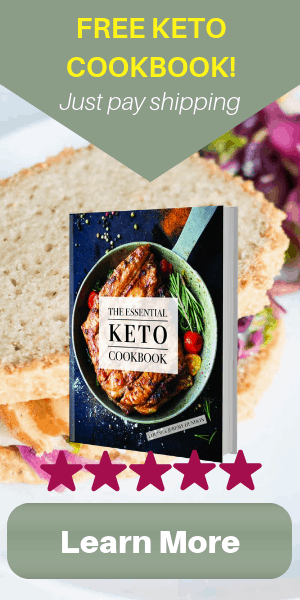 Coconut flour, psyllium husk, water, a little baking powder and a pinch of salt, make this fabulous and versatile keto flat bread, which could also work as a tortilla or a wrap. Ketohusband says it resembles a roti or chapati more than a naan. Apparently, naan is larger and thicker, whilst roti and chapati are unleavened, much thinner, and smaller in size – as these are. I have no clue about Indian cuisine, so I’ll take his word for it. What matters to me is that it’s low carb, tastes good and is easy. I’m not a curry fan, but I’m loving this flat bread with just about anything that I cook with a sauce, to ‘mop up’ the juices. It is a really quick and easy recipe that requires very little effort. Just prepare your ‘work station’ and the rest is a breeze. I keep my cooked Keto Headbanger Low Carb Naan Bread covered in cling film and refrigerated, and it lasts 3 days easily. I’ve not tried to freeze it, but I see no reason why it wouldn’t freeze well. It would be great to take full credit for this bread, but it comes from Sahil Makhija at Headbanger’s Kitchen. Hence the recipe and post title. I came across Sahil’s recipe when I was looking for naan bread inspiration. My ketohusband, who comes from a mixed British/Indian family, came up with the idea that I should create a naan recipe, given its popularity. I agreed, and had a go with coconut flour, psyllium powder, lupin flour and water. But I wasn’t sold on either the flavour or the consistency, so I asked Lord Google for help and eventually came across Sahil’s recipe. It was identical to mine (the coconut flour one that got discarded), except that I had used cold water instead of hot. Because of that, I almost overlooked it, but then I changed my mind. It looked really good in the photos, and I just felt I had to try it. I’m not usually a fan of coconut ‘savouries’. I’m sure you’ve noticed that I hardly use coconut flour in my baking, preferring lupin flour instead. But much to my surprise, the naan turned out really well. Yes, you can taste the coconut, but it’s not a strong taste and it disappears as soon as your taste buds get busy with other flavours. Because let’s face it, you wouldn’t eat it on its own, would you? To get the right ‘dough’ and right result, make sure you weigh each ingredient on metric scales. It is easy to over or under estimate spoons and cups, so I am firmly in the metric brigade. I apologise to my volume-loving friends, but I won’t budge from that stance. Without accurate measures, the most perfect, tried and tasted recipe can turn into a disaster. When you’re talking about a few grams, as in the psyllium for this recipe, no teaspoon measure in the world will get it right. Metric scales are THE ONLY way. They’re inexpensive and take up very little space in the kitchen. Mine sit on their side, upright, in a cupboard. Or propped up against the wall on the kitchen counter. There’s really no excuse. 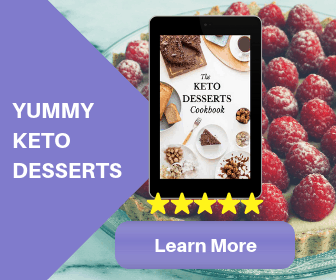 To use them, put a bowl over them, press tare so that you read zero grams, and then add your ingredients – one by one – to the required weight, pressing tare in between each ingredient to reset the scales to zero. Surely it’s easier than having cups and spoons and having to wash them all? Believe me, once you get used to the metric way of weight measures, you won’t look back. 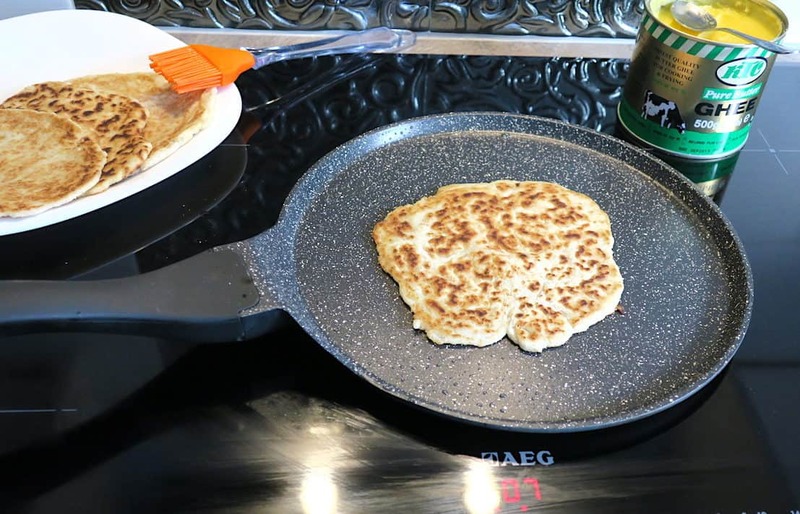 Although you can use extra virgin olive oil, coconut oil or butter, adding ghee (clarified butter) to the pan makes the best Keto Headbanger Low Carb Naan Bread. In my opinion. 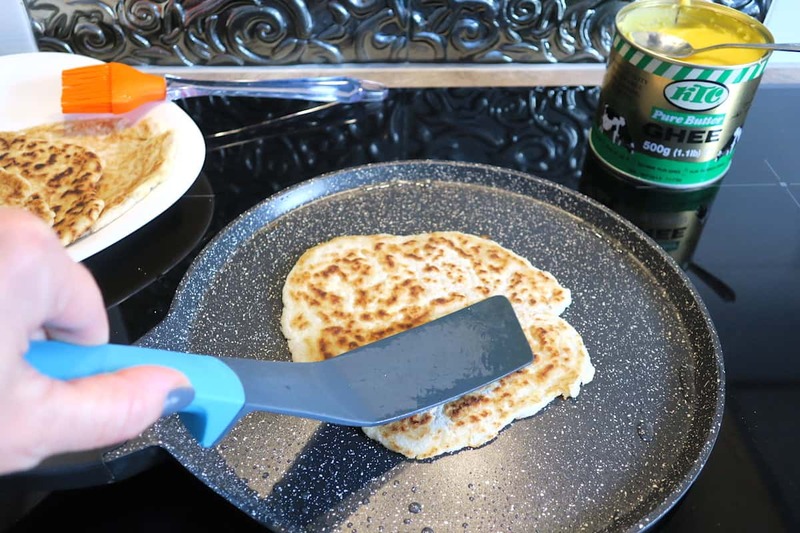 A flat, pancake/crepe/tortilla pan with a heavy base such as this one is ideal (click HERE for a U.K. equivalent), but if you don’t have/want one, you can use a bog-standard frying pan. Prepare your work station with everything you need (see photos), so you’re all set and ready to go. Here’s the recipe. You will obtain 4 naans/rotis/chapatis/flat breads about 15cm diameter. Enjoy! Cuisine: Keto. 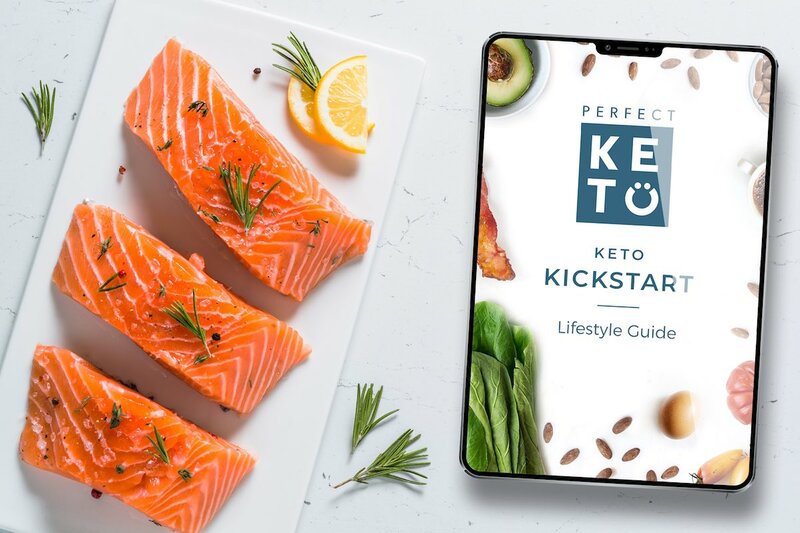 Ketogenic. LCHF. Low Carb. Vegan. Grain Free. Gluten Free. Naan. Flat Bread. Tortilla. Wrap. Versatile, super easy and super quick. heat water until hot but not boiling. add hot water to dry ingredients and stir quickly with a fork, then mix by hand until a dough ball is formed. set aside to rest for 10 mins. divide the dough into 4 equal portions; flatten and shape them between two sheets of parchment paper until thin and round-ish. heat up a little ghee in a heavy base, flat pan such as THIS ONE (U.S. option HERE) and use a silicone brush to spread the ghee all over. cook naan on medium heat (induction 10) for 3-4 minutes each side (until brown) adding a little more ghee between each flip over, and as you move on to the next naan. Use a spatula to flatten the bread as it puffs up and to ensure even cooking. Keep refrigerated in a sealed container for up to 2 days. Thanks Antya for this recipe. I tried it and it came almost what it looks like. My husband and I ate it straight away as we missed having rotis since we switched to Keto. Will post a picture next time I make it. Thank you again for the recipe! Hi Keerti, thank you for visiting my site and for your feedback. Glad you liked it! I’m so excited to try this naan bread! I miss having naan with my curry and I’ve been looking for a recipe. I can’t wait to try it! Thanks! It’s become our favourite with everything! So glad to read the nutrition information. Low carbohydrate and great taste! Thanks! I’m new to your email distribution, and am looking forward to reading your posts. I’m going to try this naan bread. (Typo I think: “but I won’t badge from that stance” should be “budge”? 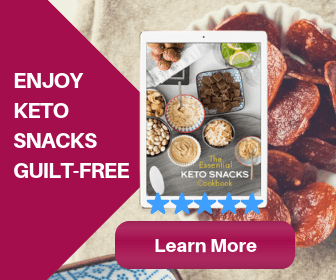 Thanks for ?spotting that, David, and welcome to my keto world. Whaaaaaat – I am so happy to see this – it’s one of the things I miss the most!! Trying this tomorrow!! !